From our apartment to Zenith there are two main possible streets, Y-Mart street (the grocery store) and restaurant street. A few days ago Wyll and I turned the opposite direction on restaurant street and we found ourselves gallivanting on the outer reaches of Gochang. It was the perfect kind of day for these kinds of shinanagins! The sun shone brightly. We were freshly showered and ready to get stinky in the short hours before work. Unsure about the direction we headed for the end of the street thinking we could look around and see if there was anything interesting. We found a recent monument and grave site for someone very important. Grace says probably a political or literary figure due to the writing being in Chinese characters. She can’t read them similar to how I can’t read Latin. After climbing all over the monument we saw a graveyard. Being that it was so close to Halloween we thought we would check it out. As we neared our approach a small dog started barking and we realized that there was nothing between us and the dog. We also realized we were walking up a private driveway and slowly recalled being told that Koreans have small family plots. We decided to take the path leading up into the woods. What is also probably private property. We walked up a hill that reminded me of where Amy and Christine lived on Bohemian Hwy. The small difference being that we are in Korea, not California’s Redwood Rainforest. I walked cautiously perhaps too wary of California’s poison oak plants (I found myself with a rash right before we left for Korea- Poison Oak is NOT fun on a plane.) We were barely out of town but you could hear different bird calls. We saw some Magpies and maybe heard them too. We might not go back but we had a good time! Wyll and I arrived early for work knowing that the farmers market is bigger on days ending in 3 and 8. Every 5 days the local farmers drive to the big city and shlock their goods from the backs of trucks. Mostly we saw bedding, shoes, dried fish, live eels, persimmons, we bought cuties, lettuce, miso paste- which I am really excited about and will probably purchase next time. One of the venders hand fed us different kinds of kimchi…? It was not very spicy, but the flavor was insane. It was very red, not fermented and soooo Good. She had a seaweed kind that we guess is vegetarian. She also had one that was mostly crab.Wyll tried it- it looked delicious. We ended up buying one that was made with abalone, I think. Funny thing is that they don’t use scales. There are two bowl sizes small and giant. I am hoping that Sunday we will be able to go with other foreigners as well as bring a camera. Friday was the first day of the festival. It opened with a parade and even though we were working all the staff marched up the stairs and onto the roof to watch. There were three basic groups; marching bands in traditional attire, martial arts in white, blue or maroon and townsfolk in white traditional clothing. The last group looked like doctors. It was very funny. 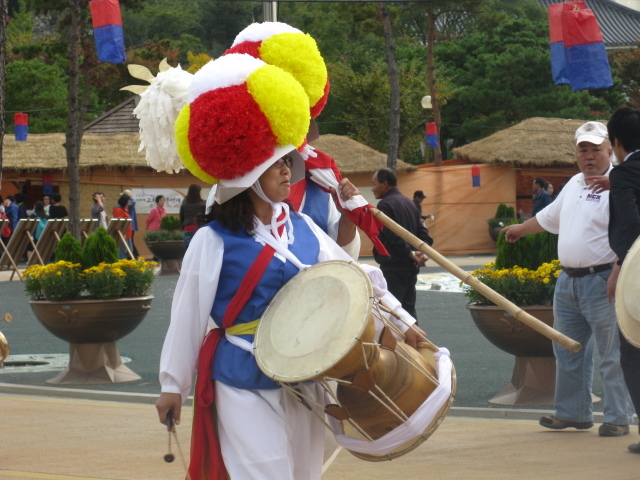 The traditional musician outfit is topped with what looks like a clown wig. At the festival there was some kind of special ceremony performance going on. 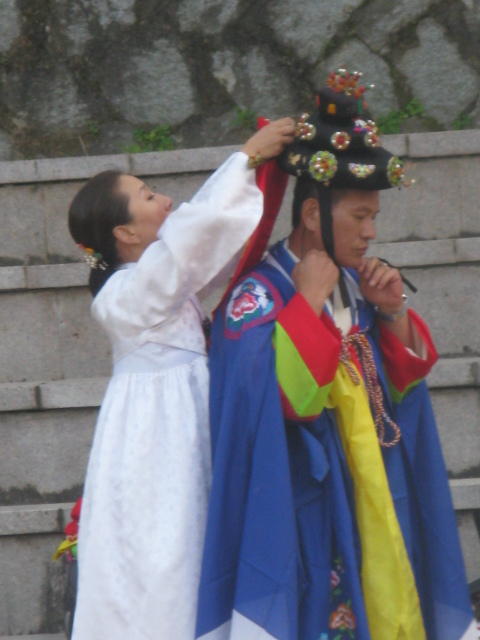 The women were wearing Hanoks which is traditional ceremony dress. They are currently worn only a few times a year for special family occasions- like for a check in with grandparents. I also captured some good video of the martial arts performance. I think I have to post those separate. Today is the first day I have been able to use my computer. Luckily the school uses HP so they have my laptop cord! Wyll and I have been whisked around from place to place for the last few days. Sunday being the exception, a much needed day of rest! Korea is so beautiful. Gochang is wild- everywhere you look someone has planted a row of squash, soy bean, rice, chilies, lettuce, diakon… We are still looking for the farmers market but the farm is EVERYWHERE! Yesterday was perhaps the most exciting. Grace met us at our apartment. She was slightly late and wearing a red coat which flowed out as she hurried into the building. Together we went to the school and met up with Sam. Sam took us on a journey! He drove us out to a bigger city for our physical exams. They took blood, we peed into dixie cups and separated it into vials, I tried not to spill it on everyone who knocked into me. Then we went to another room for something else I laid down and had jumper cables attached to my ankles and wrists then little suction things were clasped to my chest. I think we were there for maybe an hour all the exams were very short. They made Wyll run around the hospital because his heart rate was too low! It was very funny. On the drive back Sam stopped to let see a view of the whole city from a hill top. It was awesome. He drove us around Gochang showing us the sights. After we came back to the school Wyll and I went to dinner. Wyll ordered smoked chicken. It was AWESOME! I think I will make sandwiches with the leftovers. Food. We are yet to eat at a traditional Korean Restaurant. We thought we did, sadly Grace informed us that it was Japanese style. We ordered off a menu without pictures- I was very nervous. Today on a walk about we found a few traditional style but I had already made food plans for the next three days. Our apartment came with milk, cereal, bread, jam, and eggs. We thought we would buy peanut butter ($7.40 USD), apples ($4 USD each). Thankfully Persimmons grow wild here and we met a very nice lady who gave us some she had harvested. It is fun! More to come! Friday we officially started to apply for our visa. We also found out our luggage was never sent. 😦 Hopefully it arrived Saturday so we an have it for our Southern California/ Nevada trip. Yesterday we also had our going away party. It was tons of fun. It was a smallish space for a pool party, everyone who came had a good time. We had a potluck and a potlatch (where you give away your stuff). We also announced our engagement. (Unknown words and expressions!!!) Wyll and I are getting MARRIED! I am super excited to visit my grandparents and tell them in person. Then we are headed to LA to hang out with Wyll’s grandma and then Tahoe to see Wyll’s grandpa. 26 hours of driving and one week left before departure. Ending in Ukiah to give my mom the car then maybe getting a ride into the bay area or taking the bus. The plan at this point is to stay with Parents until the flight then to bart to sfo. The strange thing is that we don’t actually have our tickets. They will come. It will be amazing. Right now I’m enjoying the company of my family. Camilo is eating pizza, mom and I are gabbing away about life and change. Thea is upstairs preparing for a day of adventure. I think everyone had a great and wonderful time last night. Both my mom and Thea were excited to meet Wyll’s friends (Kevin the Slam Poet was a big hit). Mom is still lit; talking about Paula and what an amazing woman she is. I see so much of my mom in Paula. So happy that all the kids got to hang out- Mack, Theo, Cayden, Camilo running around, getting into trouble and being best friends forever. Thea and Zoey got to hang out, bonding over Dr. Who. It was just so much dangy fun.